All is not well. Beneath all those stories of happiness and positiveness and don’t-look-back-in-anger and we-can-work-it-out optimism, I am living with a constant feeling of awe about this crazy world and its crazy people, a feeling of deep sadness, vulnerability, desolation and melancholy. The free-wheelin’ Reinhard (if he ever existed) has left the building. This morning, looking at the spoon that is holding (most of the time) Pádraig’s headrest in place, I was thinking: what will I do about the spoon? 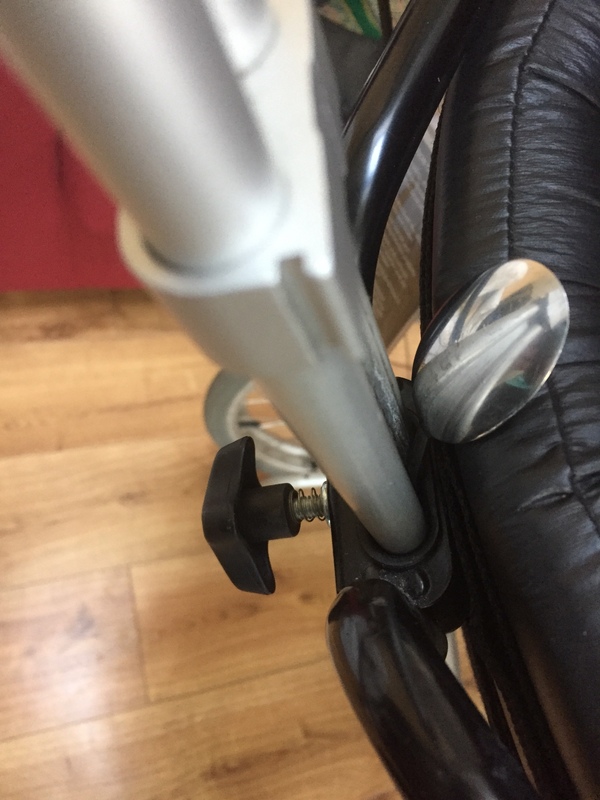 Months ago, I told the HSE about the broken screw and thread. I contacted the supplier several times, twice in the last few weeks, and did not even get a reply. Should I send another text/email or make another phone call? Should I contact the manufacturer myself, get the part, fix the chair and send the invoice to the HSE? Should I ring Joe Duffy? Should I pack my bags and Pádraig’s and leave? Should I give up altogether? There is no doubt that persons with very severe acquired brain injuries suffer tremendously and eventually die because they do not receive the treatment science and research tells us they require. It is known that their families’ mental and physical health suffers tremendously because of the injury and subsequent insults and neglect. Yesterday, at a public conference, a leading rehab consultant told us they now call their ‘pilot’ projects’ ‘demonstrators’ because pilot projects generally don’t deliver – they said. I felt a shot right into my heart and into the An Saol “Pilot” Project. The consultant knew I was in the audience. Here am I without a job, stuck, trying to manage very difficult situations, trying to stay calm, collected and positive (because that is what you do), listening to people telling me how well I manage. But today I don’t. Today I am getting another lesson in being humble. Because rage, as a very good friend told me recently, either gets you into jail or an asylum. Is being humble (yet determined) the answer? When the reality is often full of deep sadness and outrage and desperation and helplessness? How can the world keep spinning and the sun keep rising every morning. Knowing that all is not well? Thank you Reinhard for posting this honest statement of the frustration and anger that comes from working within a narrow limited service. I pray that those responsible for operating the service will learn from this the impact of their decisions on the individuals who are dependant on the service. My prayers for all of you continue as always. How frustrating for you — as if the challenges that Padraig and you face weren’t enough. You are putting in a Herculean effort and to be ignored and tossed of as “demonstrator” must feel like a blow. Sending positive thoughts and encouragement to you, and hoping the gray clouds clear soon. Good morning Reinhard. I am so sad to read ur post this morning as I understand ur situation and this may well be ours in time to come when Aisling has been discharged for whatever services the system can offer her. We are then on our own fighting the fight to get her the best there is to offer. The road we travel is a rockey and uncertain one and our energy is limited. We need those foot tapping and bum lifting events to give us the lift and renewed energy to continue the journey. Wishing u an uplifting and out of the blue event today to lift ur spirits.